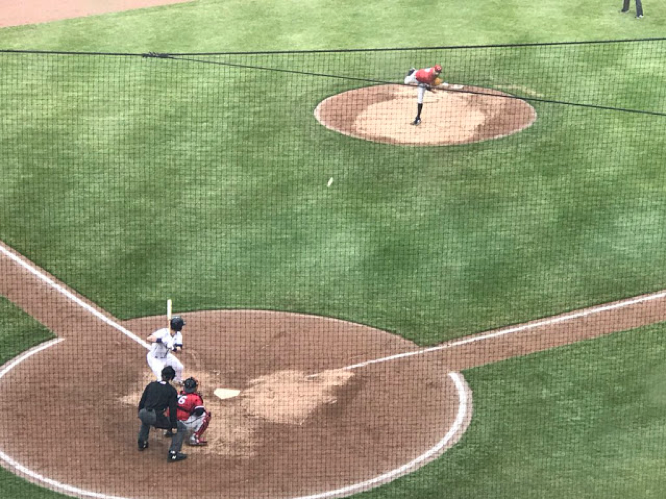 Syracuse, N.Y. – A dominant performance from Aaron Slegers helped boost the Rochester Red Wings to a 2-0 rain-soaked win over the Syracuse Chiefs on Saturday at NBT Bank Stadium. The Red Wings earned its first win in five tries against the Chiefs this season because of solid pitching from Slegers and reliever Nick Anderson and Gabriel Moya. The two combined to shut down the Chiefs, allowing just four hits. The Red Wings plated its first run in the top of the second inning, thanks to three consecutive singles. Brock Stassi and Jermaine Curtis converted back-to-back singles to start the frame, then James Ramsey brought in Stassi with… you guessed it, a single. Rochester continued to threaten to score as Bobby Wilson sacrificed Curtis and Ramsey over to third and second. Gregorio Petit popped out and Nick Buss grounded out to quell the threat. That was all of the game’s scoring until the eighth inning. Syracuse had a couple of chances to tie the game up. Slegers allowed just two Syracuse runners to reach second base in his six innings of work, but the Chiefs failed to capitalize on those situations in the fourth and sixth innings. Rochester reliever Nick Anderson entered the game and struck out all three Chiefs batters in the seventh inning. Syracuse had two runners on base with two outs in the eighth and then again in the ninth, but runners failed to reach third base in each instance. Rochester added an insurance run in the eighth inning off of Chiefs reliever Jimmy Cordero. Bobby Wilson ripped a double to the center field wall past a shallow-playing Hunter Jones to start the frame. Petit then sacrificed him over to third. Buss then flew out to shallow right field as Wilson held at third. Wilson then scored on a wild pitch by Cordero to extend the Rochester lead to 2-0. Once again, Syracuse had a chance to tie or win the game in the ninth inning. Spencer Kieboom walked to start the inning. Jacob Wilson then grounded into the hole between short and third, but Gregorio Petit’s running grab and throw was enough to get Kieboom out at second. Michael Almanzar followed with a single, setting up runners on first and second with one out. Tuffy Gosewisch popped out to Red Wings catcher Bobby Wilson behind home plate. The Chiefs’ final chance in Bengie Gonzalez struck out swinging on three pitches to end the game. The Red Wings earned the 2-0 win, its first victory over Syracuse in 2018. On a bright note for Syracuse, outfielder Alejandro De Aza continued to stay hot at the plate. His 2-for-3 day and single in the bottom of the first inning extended his on-base streak to 18 games. He entered Saturday second in the International League in batting average (.359) and was tied for third in hits (23). De Aza is a 34-year old veteran who has spent 11 seasons in the Major Leagues, and has been in professional baseball for 16 seasons. Syracuse (12-8) and Rochester (8-10) will conclude its series on Sunday at NBT Bank Stadium. Syracuse’s Austin Voth is slated to oppose Rochester’s Dietrich Enns. First pitch is slated for 1:05 p.m.